A year has gone by since Susanna's adventures in WHISPERS OF WAR. Now the war is worse, because the whole of the Niagara peninsula has been taken over by the Americans. The family home is crowded with people forced out of their own homes by the enemy. Susanna is tired of looking after her sister's baby and longs for someone her own age to talk to. Worse, her mother tells her that there will be no time to celebrate Christmas this year. 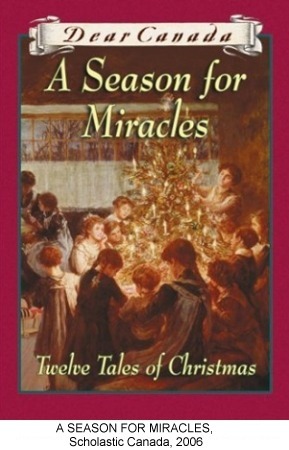 This book is an anthology of twelve Christmas stories that carry on the diaries of the heroines of twelve of the "Dear Canada" series. Each is set in a different time period in Canadian history. Because the war was much more exciting in 1813 than it was in 1812, I had trouble fitting all the real historical events, such as the burning of Niagara (now Niagara-on-the-Lake) into one short story. But I really enjoyed writing about Susanna again, who is probably my bravest character.